"Originally of Pennsylvania Dutch origin, scrapple was made from the bits and pieces of the pig not suited for anything else! This streamlined recipe takes only minutes to prepare ... perfect for making the night before. Serve topped with choice of warmed syrup." Pack into 8x4 loaf pan, cover and chill overnight. To serve, cut into 1/4 to 1/2 inch slices and saute until golden in nonstick skillet. This is Pretty Good, add more spices that the Pennsylvania people use it will be Awsome!!!! I know scrapple and this is horrible. Scrapple should not be sweet and greasy. 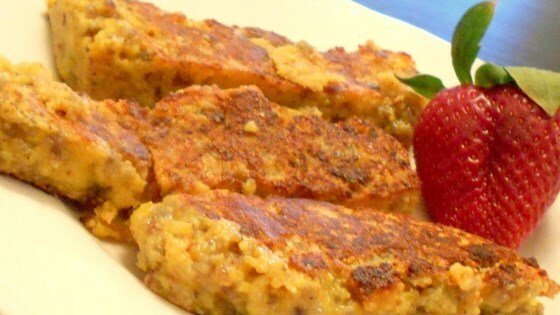 I've been trying to find an easy scrapple recipe, and this one hits the spot!! My tummy thanks you! !